Purpose-built for clinicians, TigerFlow centralizes third-party system data in a single, mobile-friendly interface that supports role-based communication for streamlined coordination with your entire care team. 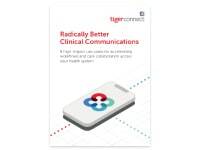 TigerText’s easy-to-use app on your smartphone, tablet, or desktop lets you receive EHR alerts, request consults, clarify orders, coordinate discharges, and manage care from anywhere in the hospital. Solve the challenge of locating the right specialist or on-call staff member with assumable Roles. Call center agents can send detailed messages to on-call staff and see when messages are delivered and read. 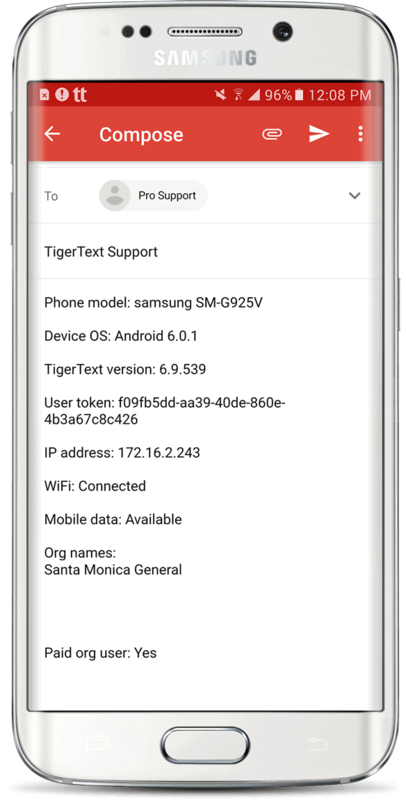 Replace pagers by routing detailed messages and images through TigerConnect while keeping your pager number. Automatically provision SAML users using your preferred authentication service. Integrate with your existing user directory to quickly on-board up to thousands of users at once and manage them from a single interface. Add customized integrations for EHR, nurse call, ADT, and other systems to enhance functionality and value. Get started right with a custom, full-scale, phased implementation plan plus best practices training and resources. Improve workflows and ensure long-term productivity with organizational performance tracking and governance from your dedicated client success manager. Keep your teams and admins connected and productive with 24/7 premium client care via priority access, AD/LDAP monitoring, and monthly case reviews. 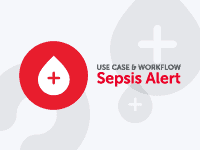 Immerse your admins and power users in this two-day, small-group training for optimizing clinical workflows through more efficient communication. Improve care team productivity with premium features like Roles, Priority Messaging, Auto-Forwarding, Delivery Escalations, Transactional Reporting and more. Track and measure organizational metrics such as active users, message volume, and feature engagement and compare them with industry benchmarks. 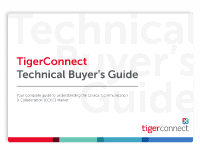 TigerConnect offers both standard secure messaging and enterprise solutions. See which product is right for you. that helps organizations transform by reimagining the way care teams connect and communicate. Improve key metrics across the board from reduced medical errors and patient wait times to lower readmissions, higher HCAHPS scores, and more streamlined discharges, not to mention a happier, more productive staff. 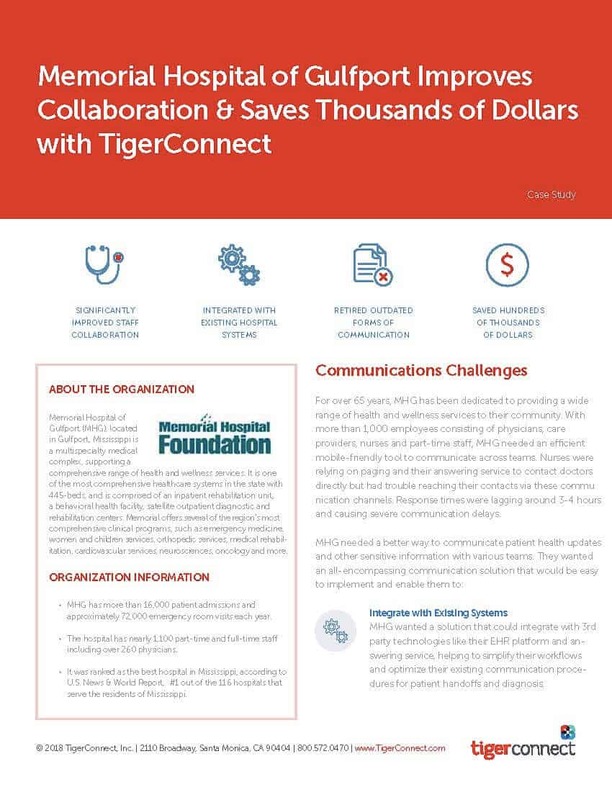 Take TigerConnect to the next level with turnkey integrations that accelerate care coordination and improve the continuity of care while role-based functionality helps team members to quickly locate and message the right individual without cumbersome lookups, rounds of phone tag, or voice messages. Get more value from your EHR investment by extending patient data to that last mile of care and delivering it in real time through a mobile-friendly, instantly actionable, easy-to-use solution. TigerFlow unlocks information stored in computer-based systems so it becomes accessible at the point of care. 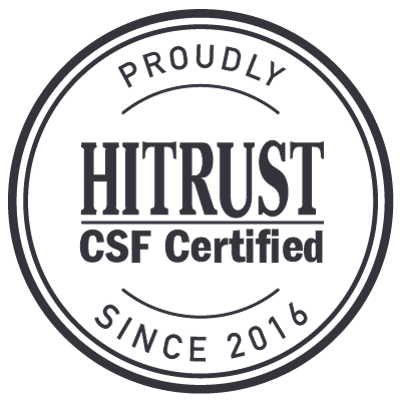 Integrated secure healthcare team clinical communication and collaboration platform for organizations looking to optimize workflows, maximize healthcare ROI, improve patient safety, as well as patient and provider satisfaction. MHG needed a better way to communicate patient health updates with various teams. They wanted an all-encompassing communication solution that would be easy to implement and enable them to integrate with their existing EHR. See howTigerConnect met MHG’s goals and saved them thousands in the process. Want to see a live TigerText demo? Fill out the form below or call us at 1-800-572-0470 to learn how we can improve care quality and communication.